Sweaters with Elvis, Don’t Be Cruel and Wild Thing on front. All by John and Molly Dove. Rock around the clock in clinging cire singlets or stomp a bit in boppy beatnik sweaters, add some lurex or fishnet tights and you’re all set to swing. Black cire singlet with pink leopard skin heart. Cire t-shirts with Marilyn Monroe and notes motifs. All by John and Molly Dove. 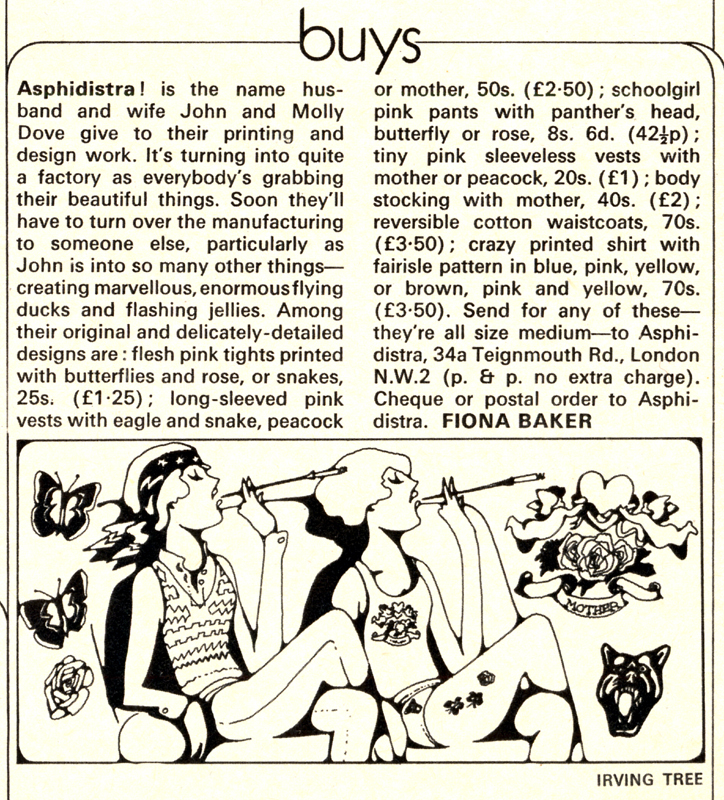 Early mention of the brilliant John Dove and Molly White, whose incredible prints – not least their ‘Wild Thing’ t-shirt – came to define the Seventies. Please do check out their website. Wonder Workshop began in 1972, so Aspidistra must have been very short-lived. You never know where you might find a cool little piece of fashion history. Here are the first two images (and the only printable ones as far as this blog is concerned!) from a spread in Fiesta. A ‘dirty little magazine’ (as Mildred Roper might spit at George) for the uninitiated among you. Our soon-to-be-starkers model is wearing an iconic ‘Wild Thing’ t-shirt, originally designed by the wonderful John Dove and Molly White at Wonder Workshop but also ripped off by large-scale manufacturers. I have no idea if our girl is wearing an original or a cheap rip-off (her skirt is obscuring the ‘Thing’ part and you can’t really see much detail) but it was a bizarrely cool spot. Plus, I want her red wedges.